Mozilla Thunderbird for Mac is a redesign of the Mozilla mail component for Mac OS X. The goal is to produce a cross platform stand alone mail application using the XUL user interface language. The intended customer is someone who uses Mozilla Firefox (or another stand alone browser) as their primary browser and wants a mail client based on mozilla that "plays nice" with the browser. Thunderbird for Mac makes emailing safer, faster, and easier. Redesign Mozilla mail component for Mac, makes emailing safer, faster & easier. ...... RSS reader, and quick search. 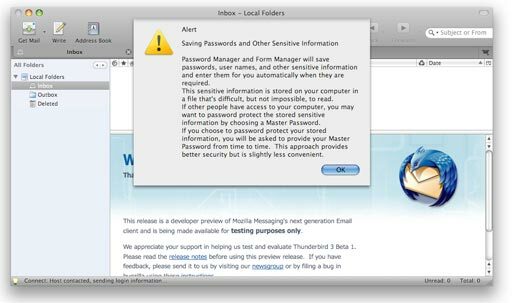 Thunderbird for Mac provides effective tools for detecting junk mail. Its tools analyze your e-mail and identify those that are most likely to be junk. You can automatically have your junk mail deleted or you can put it in a folder you specify, just in case you like reading junk mail. Thunderbird 2 allows you to "tag" messages with descriptors such as "To Do" or a "Done" or even create your own tags that are specific to your needs. Thunderbird 2 features a new find bar that speeds up searches within displayed messages. Thunderbird 2 saves you time by allowing you to store this search as a folder. Rerunning the search is just a matter of clicking on the saved search folder in the folder pane. Qweas is providing links to Thunderbird for Mac 10.0.2 2012 as a courtesy, and makes no representations regarding Thunderbird for Mac or any other applications or any information related thereto. Any questions, complaints or claims regarding this application Thunderbird for Mac 10.0.2 2012 must be directed to the appropriate software vendor. You may click the publisher link of Thunderbird for Mac on the top of this page to get more details about the vendor.